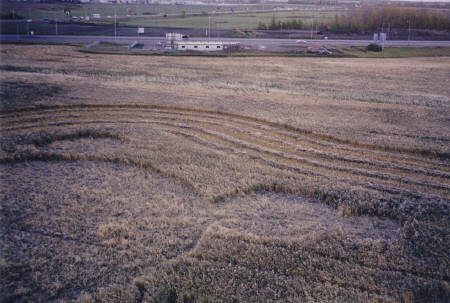 A 7-circle formation, overall length 191 feet, in thistle-infested barley field. Radial lay of crop in all circles w/counter-clockwise perimeter ring underneath top lay. Visible apical node elongation and multiple expulsion cavities in 2nd & 3rd nodes. Deep triangular hole found in small, northern circle. Multiple reports of anomalous aerial light phenomena in area at time circles thought to have formed; cell-phone failure occurred inside formation. A large (100' diameter) center circle with six adjacent smaller (from 36' to 19' diameter) circles. A counter-clockwise ring of flattened barley, ranging in width from18" around the center circle to 6" around the smallest circle, was found around the edges of all 7 circles, underneath a superimposed layer of radially-laid crop--this in all 7 circles. 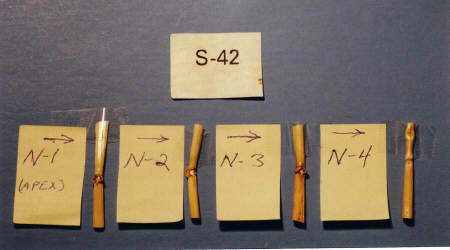 The uppermost layer of crop contained many partially-downed plants with severely bent nodes, in the range of 40-120 degrees. 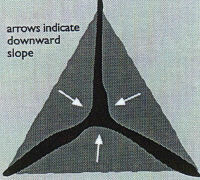 A triangular "crack" was found in the precise geometric center of the most northerly circle, 6" long to each side, into which a steel bar could be easily inserted up to a depth of 36" (see Figs. 1-4 for details). crop and directions of flow, with field notes. A few strips of plants were laid in the reverse direction of the primary radial lay: these areas are shown as dotted lines in the diagram. In the center circle there was a small mound of fresh earth, about 12 inches (30 cm) across, which looked as if it had erupted from below. The edges of the fresh earth lay on top of some of the downed crop, indicating that it spilled there after the plants were flattened. The plants swirled around this mini eruption in a semi-circular flow. There were a few more, smaller, mounds of earth in the circles, but we saw no associated variation in the crop lay in these places. In the small northernmost circle a three-way crack and hole in the ground was found at the center of the radially-laid crop. 7 circles, and her field notes (below). (a) A concentric ring of flattend crop defines the edge of each circle. Width of this ring in the large center circle is about 18 inches (45 cm); in the smallest circles the ring is about 6 inches (15 cm) wide. (b) Most of the remaining plants within the rings were flattened radially, from the center out toward the edge, laid straight and close to the soil. These plants were laid over those in the concentric rings. (c) The field is heavily infested with Canadian thistle, most of which is flattened hard to the ground along with the barley. Much of it was turning brown and drying out, as if dead. None of the flattened thistle had started to grow back upwards toward the sun. The field was sprayed with Roundup weed-killer on 9/21, about 10 days prior to sampling. (d) Some plants (perhaps 10-25% of the barley, but less that 1% of the thistle) were left semi- standing, with many severely-kinked stem nodes bent at angles from 40-120 degrees. The standing thistle plants were not obviously deformed and were still green and apparently thriving. A few young thistle plants (about 4 inches tall) grew vigorously in the formation. (e) Some wild oats in the field were also left semi-standing, in which we observed many expulsion cavities. Fig. 4: Diagram and details of triangular hole found in center of small northern circle. In the geometric center of Circle "A" (19 ft. 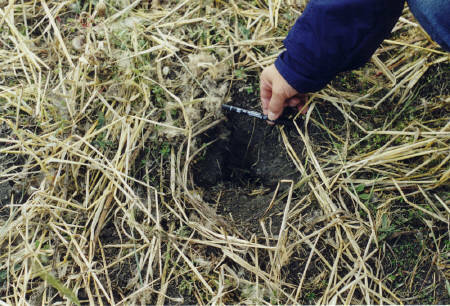 diam., most northerly circle) a triangular crack, filled with loose finely-crumbled soil, was discovered. The firmly-packed surrounding clay appears to be cut away in three flat planes, sloping downward about 30 degrees. Each plane is about 6 in. to a side. 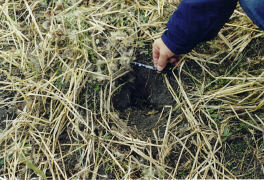 Depth of hole measured to 3 ft.
Actual barley seed-head pulled out of hole, with long "beards" intact, and with dirt in between and adhering to beards. When preparing to photograph the hole, fieldworker Judy Arndt discovered a barley plant seed-head which had fallen into (or been sucked into?) the hole, top-down. It was buried to a depth of at least 12 inches. The long "beards" on barley seed-heads not only fan out, they have serrated edges--tiny barbs which normally catch at your skin should you try to rub the beards backward (from the ends toward the base). Such a seed-head would not easily fall, beards first, into a small crack in the ground. It appears that this hole must have been at least 2 inches wide, and 12 inches deep, when the seed-head went into the hole. Further, the maturity and freshness of the seed-head indicates that it is the same age (same degree of maturity) as those attached to the flattened plants in the formation, indicating that it became embedded in the hole at the time the circles were created. How this happened, without breaking the fragile "beards," is unknown. (The radial distribution (45-degree intervals) of magnetic particles in the soil in the large center circle (Circle "C") disclosed an undulating, or crude "wave" type pattern. Since the plant node-expansion levels in this circle were significantly higher than in the controls (due to exposure of the formation plants to the heating component [probably microwaves] of the energy system involved) and were also relatively uniform throughout the circle (no particular pattern of node length increase inside the circle)--and since the volume of magnetic material in the soil was greater than normal (due to strong magnetic fields associated with the causative energy system) but was distributed in a wave-type pattern (see Fig. 10), we again have evidence of a causative mechanism comprised of multiple discreet, and probably interactive, energies. 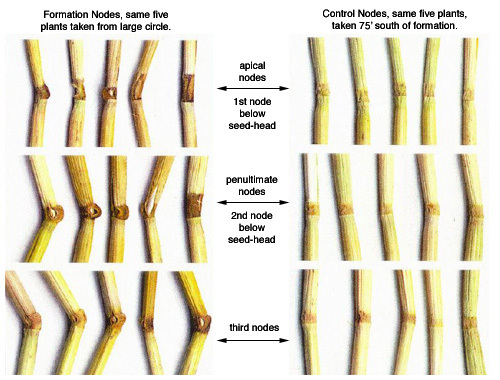 The most obvious physical change to the sample plants from inside the three circles was the presence of massive numbers of expulsion cavities at the plant stem nodes--occurring in this formation not only at the apical and penultimate nodes, but also in the third node below the seed-head (see Fig. 7). These expulsion cavities are caused as the moisture inside the plant nodes expands rapidly, due to exposure to very brief bursts of intense heat, causing the inelastic fibers of the older plant stems to burst open at the nodes as the steam escapes. Fig. 7: Node-elongation and expulsion cavities in 5 plants from inside the large circle, compared to 5 control plants sampled 75 ft. south of formation. This was one of the first cases in which multiple expulsion cavities were found in a single plant stem, with all--or nearly all--of the nodes affected down to the stem base. In many crop formations which have occurred in mature crop we have noted similar holes at the apical (first) and to a lesser extent the penultimate (second) nodes; this event is the first in which we have found expulsion cavities all the way down the plant stem to the third node. We also noted that in some of the plant samples which displayed multiple expulsion cavities, the seed-heads were missing (see Fig. 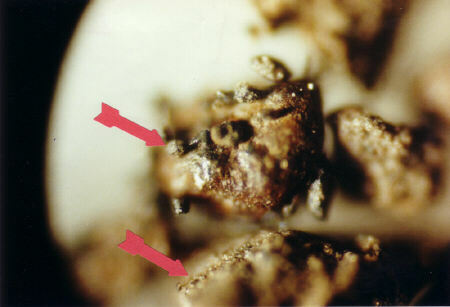 8); we speculate, here, that these seed-heads may have been either weakened by exposure to the energy system responsible for causing the multiple expulsion cavities found in their stems, and subsequently have fallen off, or perhaps were literally "blown" off at the time the formation occurred. at the base of the plant, is affected. Fig 8: (b) Lab photo showing seed-head from another Circle "B" sample (on left), compared to control (on right). 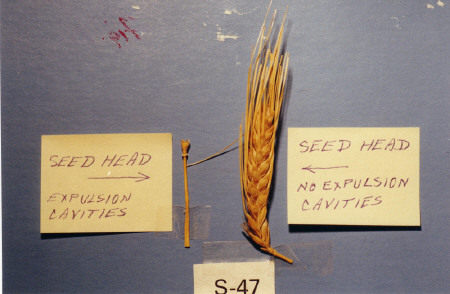 This sample (S-47) was missing seeds and "beards" which had either been blown off stem, or weakened to the point where they fell off after, or while, circle formed. The node length changes found in plant stems in each sampled circle are summarized in Fig. 9, with the percent (%) change relative to the controls indicated above each bar. All three sampled circles disclosed very significant node length increases (from +65% to +109%). It was interesting to find that Circle "A" (the sampled circle with the smallest diameter) had the greatest node expansion, a fact which reflects data from other formations examined in this laboratory over the years. In this smaller-diameter circle the angular momentum, or vorticity, of the plasma vortex would be expected to be much greater than that within either of the larger sampled circles, a fact which is pertinent, later, when discusing the volume of magnetic particles found in the soils. In the 100'-diameter center circle (Circle "C") radial samples were taken at 45 degree intervals around the formation; the node length data in Fig. 10(a) shows a relatively uniform distribution of the energy components which produce node expansion. At the same sampling locations in Circle "C," however the soil samples, as seen in Fig. 10(b) below, reveal a distribution of magnetic material that was very non-uniform. The magnetic particle data produces the appearance of an undulating pattern, with maximum deposits of magnetic material at the primary compass directions. Fig. 10 (a): Distribution of Node-Length Increases Along Radii of Circle "C" (100'-diameter), Revealing a Relatively Uniform Distribution (KS-04-176). Revealing a Rough "wave-like" Pattern (KS-04-176). 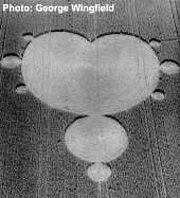 The differences in node-length increase and magnetic particle distribution, illustrated above, demonstrate once again that multiple, probably interacting energies are involved in the crop circle creation process. Perhaps what we are seeing here is a resonance-effect between the cloud of magnetic particles in the vortex energy system and the Earth's magnetic field. The uniform distribution of node length changes and the undulating pattern of the magnetic particle distribution, both found in Circle "C," is further evidence that the energies responsible for the node expansions operates entirely independently of the energies distributing the magnetic material. An 8-day germination test disclosed no significant growth differences between the seeds from the circle plants and those from the control plants. Since this formation occurred late in the growing season, the seeds were at--or very near--harvest maturity and would, therefore, be less likely to be influenced by the formation energies. If, as suggested from the node length data for Circle "A," the energy system responsible for creating this circle was rotating at a much higher angular momentum (as would be expected), then one might expect this circle to contain the minimum volume of magnetic material. We have found in the analyses of many other formations that the distribution of magnetic material (see Fig. 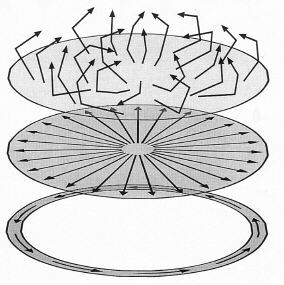 11) within and outside a circle vortex area follows the physical principles of centrifugal forces: that is, the smaller-diameter vortices with higher rotational energy deposit the least amount of magnetic material inside the downed-crop area--because it has been "thrown" outside the confines of the visibly-downed region. Partially Ablated--Adhering to Soil Chunks (KS-04-176). In Table 1 the magnetic drag data from soil samples taken within the three circles and control regions are summarized; as expected, the smallest circle, (Circle "A") contained the least amount of magnetic material of the three circles sampled. The plant and soil abnormalities discovered in the laboratory analyses of this well-documented and carefully sampled crop formation strongly support the presence of a complex, thermodynamically-unstable atmospheric plasma system as a causative agency; in our opinion there is no possibility that this crop event was manually created.